Release Date: 1996 Running Time: 15 mins. A window in Cuba’s struggling Jewish community, Trip To Jewish Cuba shows how Jews from two very different nations can inspire and learn from each other. The film follows an enthusiastic American-Jewish aid mission as it travels to Cuba to observe and help the island country’s Jewish community. “They need so much, but they have so much,” one American woman says of the spiritual richness of the Cuban Jews she encounters on her visit, reflecting on what she does and does not have in her own life back home. When Jews were being persecuted in Europe before the Second World War, Cuba was the first country in the Americas to take them in as refugees, and the Cuban Jewish community initially flourished. Numerous Yiddish newspapers were distributed and anti-Semitism during the war years seems to have been non-existent. But later, the Communist revolution led by Fidel Castro drove out 90% of Cuban Jewry. The revolution was not directly anti-Semitic, but it frowned on religion in general, making life for practicing believers challenging — not to mention the fact that most Cuban Jews were middle class private business owners threatened by the change in economic system. By 1989, what had once been a vibrant Jewish community had less than 800 practicing members. In recent years, there has been a growing movement among American Jewry to support and strengthen the Cuban Jewish community. American Jews have donated their money, supplies, and time, in the hope of strengthen the neighboring nation’s religious life. Trip To Jewish Cuba captures the experience one San Francisco based group’s exciting trip to a foreign nation, where the kindness of the people and strains of familiarity provide them an eye-opening and positive encounter that went well beyond their expectations. 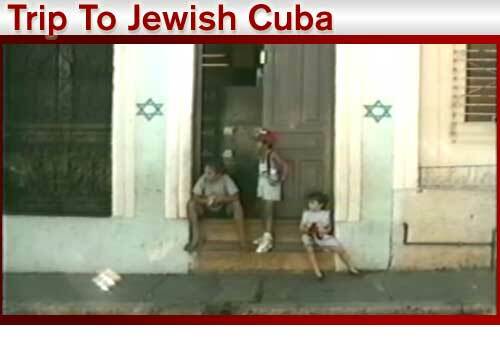 Trip To Jewish Cuba points out just how much the Americans can learn from the Cubans they are ostensibly helping. Seeing the Cubans’ struggles makes their accomplishments seem that much more admirable, and causes the Americans to rethink their own sense of commitment. “The feeling inside the synagogue!” an American woman exclaims, noting, “These are people who are proud to be Jewish.” Unlike American Jews who can afford to take their faith for granted, Cuban Jews have to make a strong effort just to keep their tradition alive. Their enthusiasm to learn and pride in their accomplishments inspires their American visitors. Amidst it all is one particularly inspiring story that shows just how much hope can be held for the Jewish future in far-flung communities. One year before the documentary was shot, a rabbi traveled to Cuba and taught five eager students how to read the Torah. When the documentary was being filmed a year later, he returned to teach another five students – but found that one of his former pupils had taken it upon himself to teach students of his own. As a result, in just two years, the Cuban Jewish population went from not having a single Torah reader to having a number of community members capable of reciting the holy text. Despite obvious cultural differences, Jews from around the world share a common understanding. As one American visitor makes a trip to the synagogue, she passes by blocks of broken-down row houses. She’s utterly lost, unsure of the way and of the language, until she comes upon the only markers that separate the synagogue from the rest of the neighborhood — two blue Stars of Davids on either side of the synagogue’s door. The meagerness, the culture, and the language in Cuba are all foreign to her — but when she reaches the synagogue steps, the children loitering outside offer the familiar greeting, “shabbat shalom.” And she’s put right at ease.